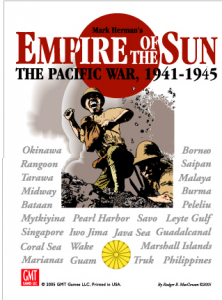 The Empire of the Sun (EoTS) is a great strategic game on the entire Pacific War 1941-1945 designed by Mark Herman and published by GMT company. It is really an interesting game with many new additions to make feasible to play the entire WWII in the pacific theater in one weekend sitting session. I plan to review some of the features of the game that attract me the most, but I would also like to add information related to those details that, specially for me and other players, may contribute to the immersion in the game and assist in providing historical flavor. The cover of the Empire of the Sun game. More than 25 years, I bought the Pacific War by the same designer, Mark Herman. I think he is one of the greatest wargame designers in the world. Pacific War is a superb game. I played several times some scenarios and tactically is a great game that faithfully reproduces the historical battles, providing new opportunities to win or lose them, and gives us enough realism to be completely embedded in the game. The drawback is that, such much details for a battle, operation or campaign, decrease the playability of the entire war. Too many counters, multiple dice rolls, long Chinese Front etc. I would like to play the entire Pacific War campaign using this game but currently, it is difficult to find time to spend in only that game. Therefore, different options are always in my radar to enjoy the strategic flavor of the entire Pacific Theather, without losing too much realism or plausibility. And I was with these thoughts when I discovered the Empire of the Sun and some other games such as Axis Empires: Dai senso and Pacific war: Admiral edition (PC only) that allow players to enjoy the entire war. 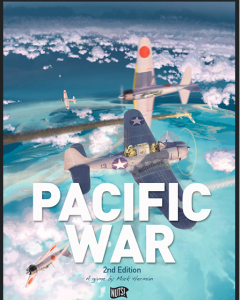 In this report, I will focus on EoTS but I would also like to review most of games that deal with the pacific war. I hope that these game reviews can help to all people interested in History, Strategy and War Game simulations.